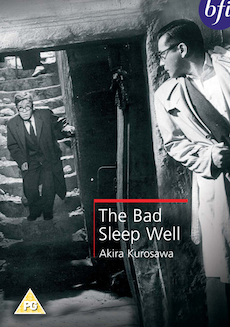 The Bad Sleep Well, the first film made by Kurosawa's own, newly founded production company, was also the first over which he had complete control. He wanted to make 'a movie of some social significance' and decided to target the culture of corruption he saw pervading post-war Japanese society. This impressive tale of greed, corporate corruption and revenge is a powerful indictment of the dark side of business and politics with distinct overtones of Hamlet. Koichi Nishi (Toshiro Mifune) is a grieving son seeking revenge for the 'suicide' of his father. By assuming a new identity he rises through the ranks of the Public Corporation and cynically marries the President's daughter to better infiltrate the company and expose the corrupt practice that was responsible for his father's death. However, as Koichi falls in love with his wife, disaster looms. Kurosawa directed three adaptations from Shakespeare. Two were recreated as samurai movies: Macbeth became Throne of Blood (1957), and King Lear inspired his last major film, the epic Ran (1985). The Bad Sleep Well comes between the two and is the least-known. In addition to its contemporary setting it is the freest adaptation of the three. extract from 'Kurosawa on Kurosawa' from Sight & Sound, Autumn 1964.